Some video borescopes are ideally suited for certain Contraband inspections. Frequently used by Border Patrol officers, Videoscopes can provide a detailed view of items hidden within the internal parts of motor vehicles. 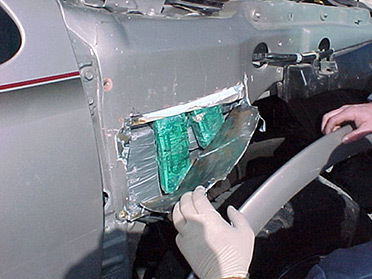 Smugglers will attempt to hide goods in gas tanks and various other crevices in the undercarriages of cars. Some law-breakers will even hide illegal goods within the panels on both the inside and outside of the vehicle. Fiberscopes, Borescopes, and Videoscopes can also detect contraband behind locked rooms and hidden in potentially-dangerous sealed packages.